Well, they're definitely here - apparently there's one in town. Must go and have a dribble on it. 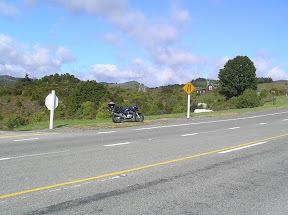 After seeing my first one on the road last weekend there's also been some chat on the Kiwi Biker website and I found the following link to a road test there. Trawling the Kiwi Rider Website yesterday there was a number of posts about a ride on today. A group of riders from Wellington had organised a Winter Solstice run coming up through the Wairarapa. Also, a group from Ashurst/Palmy were heading down to meet up with them for lunch. With the weather not having been the greatest, I decided to see what sort of day we ended up with before deciding to go or not. Come Sunday morning it was still blowing a fair bit so I did some chores around home & walked the dog etc. When I finished this (11am), I checked the website again and found out that the Ashurst crowd were leaving at 11! Damn! I grabbed my gear and hustled out the door. By the time I got fuel etc it was 11:30 before I left Palmy - I thought that there'd by no chance of catching up with anyone. So I headed off over the track and around Mangamire and on towards Masterton. The weather was definitely better over that side of the ranges - still a bit of wind but pretty sunny and definitely not cold. I pottered on through Masterton & Carterton - there were a few bikes about but I didn't see a big bunch of bikes anywhere. When I hit Greytown I decided to turn off and head out to Martinborough. When I got there there were a number of bikes about - saw my first GTR1400 in the flesh and one of those weird 3 wheeled scooters as well as one of the new BM dirt bikes and a KTM Supermotard. 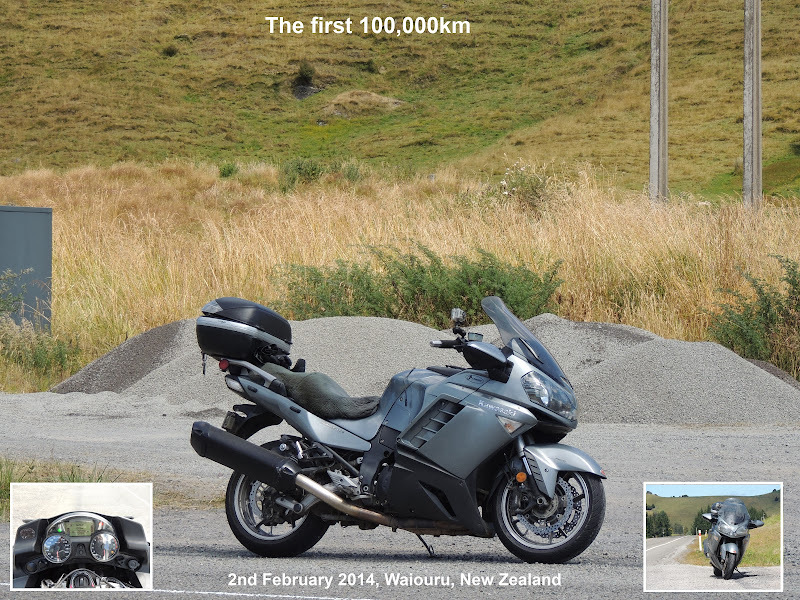 I took the long way back to Featherston and also saw a few bikes there stopped for lunch. Quite windy in Featherston and I also stopped for a quick bite before tackling the Rimutaka's and then heading back through to Waikanae via Staglands. Great Ride Number Four - Takaka Hill, South Island. 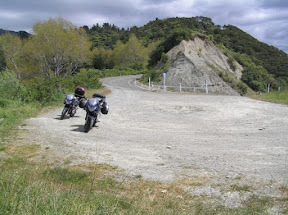 Since I've started writing up these great rides there's also been a bit of talk on the Kiwi Biker website about the best roads in the country. 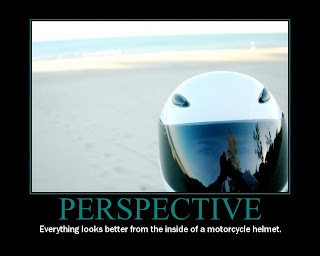 So far people have mentioned all the one's I've posted so I guess we motorcyclist's are in agreement on what sort of roads make up a good ride - generally scenery & corners (not necessarily in that order). 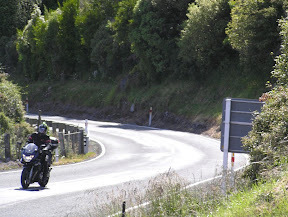 The Takaka Hill is another ride that has also been mentioned on the Kiwi Biker and I was lucky enough to get a chance to tackle it last Christmas. If you were only allowed one word to describe the road it would be "corners" - a good place to put some wear on the sides of your tyres. 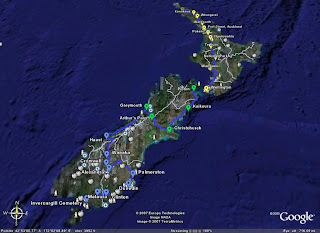 This ride is similar to the Milford Sound ride as it is a there and back ride. 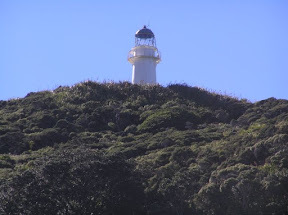 If you're based in the Nelson/Richmond area it makes a good day trip as you get to cane the hill, stop if in Takaka or Collingwood for a bite, maybe head out to Cape Farewell (some gravel) and then turn around and tackle the hill again. The hill road climbs up to nearly 800m and there are not many straight bits joining the corners. Once up on top there are a few areas where you can pull over and check out the great views either side of the hill. When I rode it in December I ripped up to the top of the hill, pulled over and whipped my camera out to see if I could get a photo of the old man and my brother in-law coming up over the top on Dad's BM. Bad luck, when he came past he was passing a line of cars. Never mind, back on the bike and after him. Never mind, we carried on and did the lunch thing and went on out as far as Puponga where we climbed the hill (hot work in bike gear) and had a good look out towards the Cape & Farewell Spit. Also watched some seals surfing below. Well worth tackling a little bit of gravel. On the way back up the hill there was a truck broken down on one of the big corners and traffic was built up behind it. I was lucky enough to get past and had no traffic to worry about all the way to the summit - yeeha! A quick stop in Kaiteriteri for some gas & an icecream before heading back into Richmond - a great ride. Ventured out in the cold yesterday for a ride over to Hastings. To celebrate the almost shortest day. Left home in the frost with zero degrees showing on the thermometer. Once I hit the gorge, I also hit the fog. It stayed foggy all the way to Dannevirke. It was so cold that the moisture froze on my visor, gloves, and the front of my jacket. I stopped at Dannevirke for gas and couldn't get the cap open because it was frozen too. Eventually got it and continued on via Highway 50. Came back form Havelock North via Middle road to Waipawa. This is a great bit of road and well worth a look if you haven't done it yet. Had lunch in Waipuk and got home about 3pm. Even then it was still only six degrees. Once upon a time I was a learned rider and restricted to a 250. After 3 months or so on a Yamaha XS250 Dog I finally moved up to something a bit better - a Suzuki RG250. 250ccs of two-stroke power! It was great: really light, handled properly and when you gave it some you got a kick in the pants when the power finally chimed in. Anyway she was a great bike and I did 10,000 miles on it - commuting and chasing my old man's GSX1100 around. One day Dad had heard that a bunch of guys on old classic bikes were doing the Napier-Taupo, re-creating the old mail run (which would have been a real mission when those old bikes were new). And so we headed off with a few other guys. Once out in the Esk valley the poor old RG started to miss a bit with one cylinder cutting out every now and again. I stopped and told the old man about it. His suggestion - keep the revs up and maybe she'd clear her lungs a bit. So off we went again. Almost as soon as we started heading up into the hills the weather started to pack it in and pretty soon it was raining quite heavily. Now we come to the interesting bit: I'd enter a wet slippery corner pulling 7,000rpm on a 125cc and all of a sudden the other cylinder would kick in and I'd be right in the good old power band - interesting all right. I managed to stay on the bike and we got up on the tops where we promptly hit both road works and fog. After a while I had no choice but to lift my visor to see and then my glasses started to get all wet and fogged up - great stuff. So far I've posted three "Great Rides", so how about some not so great rides. Ones that have been difficult, trying, tough, dangerous or just plain hard. Yunno, ones that make you question whether you should have attempted them or should even be on a bike and then once they're in the past you look back on them and can't help having a good laugh! 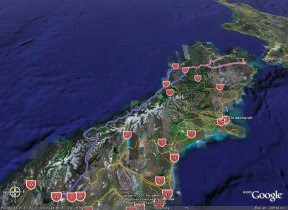 It’s really hard to pick great rides from merely good rides in the South Island – any ride in the South Island is a great experience. There’s always good scenery, mostly good roads and generally less traffic. 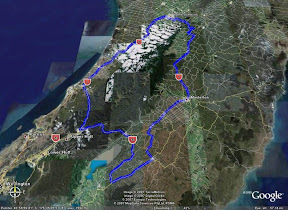 The West Coast is really a selection of great rides that start with just getting there via Nelson, Wakefield, Golden Downs, Murchison, Inangahua and finally the Buller Gorge and on to the Coast proper. Or you can of course come straight through from Picton, Blenheim and up the Wairau Valley. Weather seems to be the main reason that people shy away from the West Coast and that’s a shame – sure I’ve been as wet as you can get down there but I’ve also experienced some superb weather which combined with the ride made for a truly magic day. On one of my trips down the Coast, we got rained on (vigorously) from Punakaiki all the Way to Franz Josef and I was soaked through and freezing by the end of it. But the next morning was fantastic and we enjoyed an awesome flight over the glaciers followed by a stunning ride all the way through to Wanaka and Queenstown. If you’re going to let a little weather put you off experiencing the Coast then you’ll be seriously missing out – pack your wet weather gear and just go! If you’re heading to Westport or going down to check out Cape Foulwind or the Pancake Rocks at Punakaiki then from Inangahua you’ll have to go through the Buller Gorge. This road twists and winds following the Buller River to the Coast and is a lot of fun (had fun chasing a Morgan V8 through there one day) but watch the narrow, one-way sections. 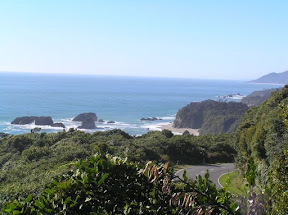 Once through the gorge you can turn North towards Westport (and Karamea – haven’t gone that far yet) or Southwards to Punakaiki and Greymouth. 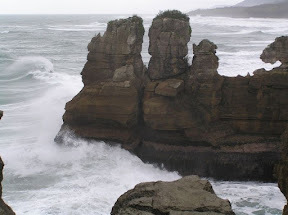 It’s worth stopping at Punakaiki for a look at the Pancake Rocks and blowholes. There’s a café there and the local wekas will come out to say gidday. 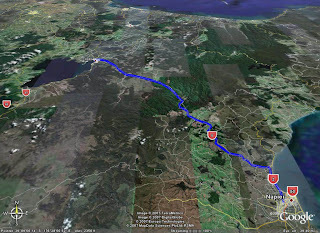 The ride from Westport all the way down to Hokitika is more or less all coastal highway and nothing too demanding. On a rough day the surf really crashes in and the place really does look pretty wild. South of Hokitika you get away from the Coast at times and ride through scenery that alternates from dairy farms to native bush. Traffic thins out a bit more, although the tourists are well represented in there motor homes and rental cars. Once you hit Franz Josef you’re in postcard country – bush clad hills, snowy mountains etc. As mentioned above, I’ve taken a flight over the glaciers and would highly recommend it. 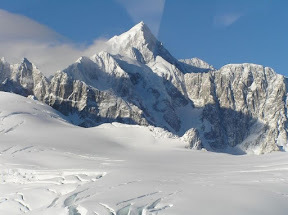 We passed on the chopper ride and landing on the glaciers and took a fixed-wing flight which took us over both glaciers as well as along the Coast and over the Franz Josef township – the views were spectacular and we got some great photos. Between the glaciers you can find motorcycle heaven – a great winding road that actually has two corners marked 15km/h! Great fun if you don’t get stuck behind a camper and the weather is good. 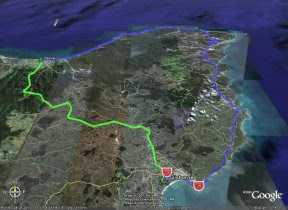 Once a bit further South you alternate between great roads through native bush to small sections of coastal highway. Keep an eye out for a lookout on your right – on a good day you can see Mount Cook form here. 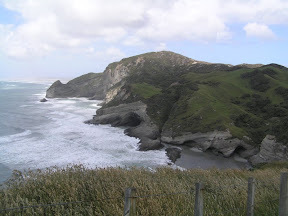 Another good place to stop is Knights Point were you can get a good view up and down the Coast. 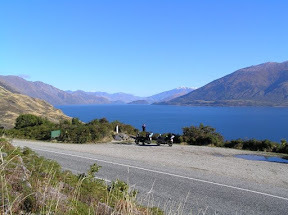 Then it’s on down the road to Haast and on into the Haast Pass through to Wanaka. Now we’re talking – this is why you came down here. 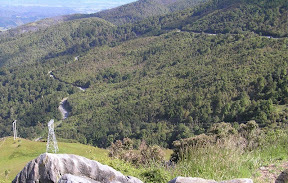 A truly magnific ent ride which has everything – a fantastic winding road surrounded by awesome scenery. There’s plenty of places to stop and checkout waterfalls, lakes and the bush clad hills. I’d rate this ride 2nd only to the Milford Road for its scenery and the brilliant ride. 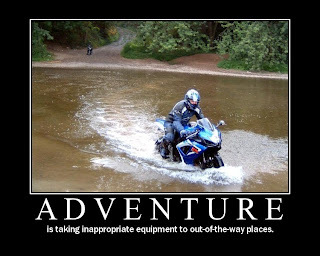 You’re not a motorcyclist if you don’t enjoy this ride! - get on ya bike and do it – no excuses! Check it out, written by a true motorcyclist! Been awhile since I have made an entry, so thought it was time I updated everyone on what I have been up to over the last few months. 1. Completed the CDMTC 800K's in a day earlier in the year. Did it easy finished in about 10 hours. It was a really hot day and the beer and meal at the end was much appreciated. 2. Had the bike serviced and new rubber fitted in preparation for the Southern Cross. 3. Last week in April completed my second southern cross. 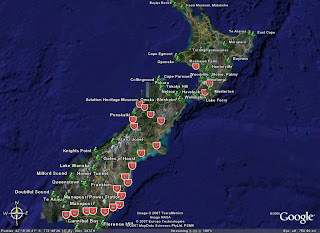 Attached a week of touring and sightseeing in the South Island afterwards. 6500k's in 12 days. 4. Back home for another service. 5. Been a bit quite since. Work and weather have got in the way a bit. Got a small ride in yesterday. Vinagar Hill, Hunterville, back roads to Fordell and home again. Got rained on a couple of times road was wet and slippery in places. 6. What's coming up. Have already entered the 1000 Mile Grand Challenge in October. 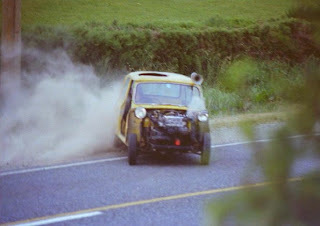 And the Mini's Return to be held next March. But I'm sure there will be more to come before then. 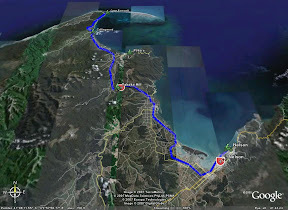 This ride can be taken as the long way to get between Gisborne and Opotoki or if as a big loop if you return via the Waioeka Gorge. I've ridden around the Coast 4 times (twice as a part of the Rusty Nuts Southern Cross) and have done it in both directions. 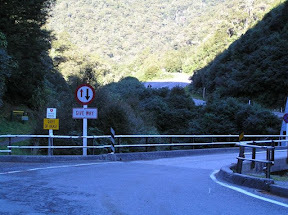 I've also ridden the Waioeka Gorge 4 times (twice in the dark on the Rusty Nuts Grand Challenge and once in the wet). Both roads require plenty of rider attention: plenty of corners, roadworks and wandering stock (goats, cattle, sheep and even an emu!) Don't let any of this put you off - the road is a great experience and lets you use the edges of your tyres to the max. One other thing to be aware of is fuel - there's not much on offer out there and they want plenty of cash in exchange. Coming from Opotoki there's pretty much nothing until Te Araroa, past here there's fuel in quite a few places - Ruatoria, Tolaga Bay etc. The road out to the Cape from Te Araroa is about 20km long and is mostly gravel. I haven't actually been up to the lighthouse (bit of a climb in biking gear) but I'd say that the view would be pretty spectacular. I guess the things that make this ride a great one is the combination of great biking roads with little traffic and some great scenery. Coming around the coast from Opotoki early in the morning on this year's Southern Cross the little bays and beaches looked fantastic - the sun was shining and the sea was flat calm. It's only been advertised for a week but the entry is already in the post. Already dreaming/talking about how to attack it. Can't wait - great to have another run down south next year, after all it's 2 years until the next Southern Cross. Oops, accidentally deleted this map. Check out this blog for our maps. How to wreck an R1! Man, we've only just got back from the Southern Cross and the Rusty's have already got next year's South Island ride sorted! The calling it the Mini's Return and it's following the route taken by the stolen mini in Goodbye Pork Pie - only in reverse. Again riders have to be at certain places at certain times and pick up flags (just like in the movie). Sounds like a blast - better get my entry in.